The Alpha 65 performs just as well with instrumental music as with electronic music, and is characterised by its great versatility. Alpha 65l is composed of a 6.5” (16.5cm) woofer/ midrange speaker with a Polyglass cone loaded in a large laminar port associated to a 70W amplifier and of a 1" (25mm) aluminum inverted dome tweeter (35W amplifier). Alpha 65 has a frequency response of 40Hz to 22kHz (+/- 3dB). 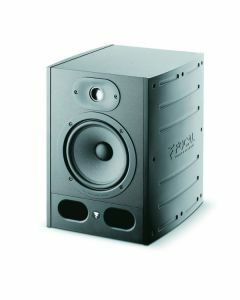 Focal's Alpha 65 is characterised by its versatility and is ideally suited to use in areas with restricted space. The Alpha 65 is made of a 6.5” woofer / midrange speaker with a Polyglass cone loaded in a large laminar port and of a 1" aluminium inverted dome tweeter. It provides a 70W amplifier for the tweeter and a 35W amplifier for the woofer, and has a frequency response of 40Hz to 22kHz (+/- 3dB). A feature for which Focal has gained notoriety is the inverted-dome tweeter - it's a key factor in the magic internals behind the Alpha 65’s outstanding performance. The specific advantage of the inverted dome is that it augments the mechanical coupling between the voice coil and the dome. Because the voice coil is fixed at mid-height on the dome, it’s capable of evenly moving the Alpha 65’s entire cone surface. This design delivers innate high efficiency, accuracy, and energy, all resulting in a tremendously detailed soundstage. Of course, the Alpha 65 capitalises on that to full effect by employing an aluminium/magnesium alloy for the tweeter material.